Holidays are a hard time to eat well. Personally it starts with pumpkin spice everything for me then tapers off at New Year, but I am going to post some swaps that might be helpful and include the (brutally) honest comments from my family. The first is cauliflower bites, we had some cauliflower that was about to be past the pale and looked to google for some way new to cook it. This looked promising and thought why not. At first the kids thought they were going to be chicken nuggets and were only mildly disappointed. At any rate they finished the bowl. These are pretty simple and look like they would travel well for short distances if a pot luck is in your holiday future. 1. Preheat oven to 400F. 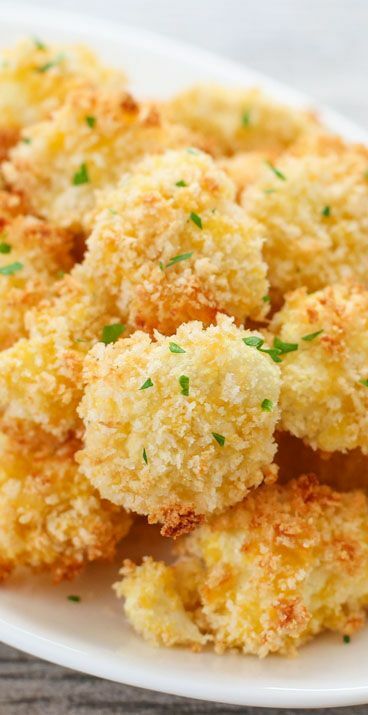 Add panko and cheese to a large bowl and then mix together until thoroughly combined. Dip cauliflower pieces in egg and then roll in bread crumb mixture until fully coated and place on a baking sheet lined with parchment paper. You may need to press on the coating to help get it to stick to the cauliflower bites. Repeat until all cauliflower is coated. 2. Bake for about 20-25 minutes until coating is a dark golden brown and crunchy. Serve with marinara sauce. Next Post Ma where are my fat pants?